Did Ellen White predict 9/11? Or did she prophesy even worse to come? Is God still working through spiritual gifts today as He did in the apostolic era? See below for highlights of newer items. Welcome to the Ellen White information website! Who was Ellen G. White? This widely read and sometimes controversial author is the most prolific woman author of all time, having written over 100,000 manuscript pages containing 2.5 million words. She is also one of the most translated authors in the history of literature. 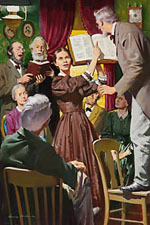 One of the founders of the Seventh-day Adventist Church, she received her first "vision" in 1844 when a Methodist teenager, and she continued her work until the early 1900s, claiming to be a "messenger" of the Lord with dreams and visions from God. Did God send a prophetic message through the pen of Ellen White? The evidence is here for you to come to your own conclusion. 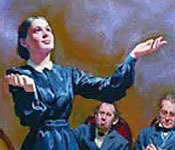 Life Sketch — Here's a brief sketch of the life of Ellen White as well as links to a more detailed account of Ellen White's life story in her own words. Vision Experiences — Eyewitness accounts of supernatural phenomena attending Ellen White's visions; depictions of things no one knew anything about; timely counsel that helped others avoid some embarrassing situations. Predictions Fulfilled? — See for yourself whether these samples of Ellen White's predictions were fallacies or whether they came true. Future Prophecies — Were there any prophetic messages that Ellen White wrote that would be of significance to someone living in the twenty-first century? Jesus the Christ — Read some of Ellen White's profound insights into the life and work of Christ, and His ministry for fallen man. Satan the Devil — Discover the counterworkings of Satan, including his masterful impersonation of Christ in the time of the end. Theology & Beliefs — See for yourself what Ellen White believed regarding Bible principles. Criticisms & Critics — It's not hard to find critics of Ellen White. Are the criticisms justified and accurate, or are they just smoke and mirrors? You decide. Books & Writings — The best way to evaluate a person is to read their writings for yourself. Here are a few of the popular books by Ellen G. White. The Seventh Day: Revelations From the Lost Pages of History — a 5-part video documentary, is now available for viewing in the Audio Video Resources (see link also on the left navigation bar). In the Books and Writings section, the online books have been expanded to include more titles, and color illustrations have been added to many chapters. Audio books have been added for several major titles, and more audio books are on the way.